A joint Norwegian-French investigation hopes to reveal that Norwegian Viking noble Ganger Hrólf was the same person as Rollo, the first Duke of Normandy – and the forefather of the British royal family. Rollo, sometimes known as Robert I, is estimated to have lived between 846 and 931 AD, and was the first ruler of a Viking settlement in France that later became Normandy. His direct descendants became the British royal family after the Norman invasion of Britain in 1066, when Rollo’s great-great-great-grandson, William the Conqueror (William I of England), successfully conquered England. William the Conqueror’s direct descendants include current Queen Elizabeth II. Danish and Norwegian historians have long debated whether Rollo came originally from Denmark or Norway. 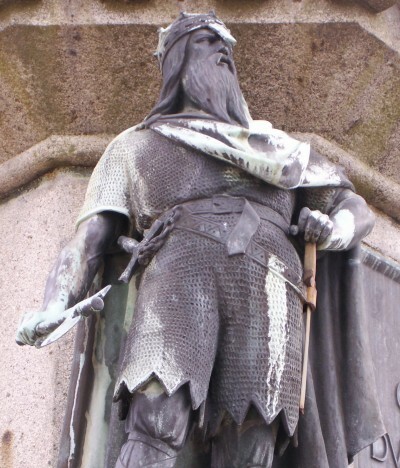 Accounts by Dudo of St. Quentin and others name Rollo as the son of a Danish king, while many Icelandic and Norwegian sagas equate Rollo with Ganger Hrólf (Hrólf the Walker), the son of a Norwegian earl from Sunnmøre in west Norway. Ganger Hrólf (written as Gange-Rolv in Norwegian) is believed to have become an earl of Normandy after conflict with Harald Fairhair, also known as the first king of Norway. A statue of Rollo by a French sculptor was given to the west Norwegian city of Ålesund in 1911, when debate between Norwegian and Danish historians first raged, during celebrations of 1000 years since the founding of Normandy. Newspaper Aftenposten reports that French and Norwegian researchers now hope to prove that Rollo was indeed Ganger Hrólf. They plan to use DNA samples from Rollo’s grandson and great grandson, Richard I and Richard II respectively, to find out for certain, as no remnants of Rollo himself are available. As Danish and Norwegian Viking kings had separate familial lines, it is hoped that the research will clear up the mystery of Rollo’s origin. The researchers now await an approval process that could last a month. In anticipation of a positive answer, the Norwegian team is planning to travel to France “in the first half of July,” and hope to finish their work by the end of September, before the marking of Rollo’s 1100-year anniversary and the establishing of Viking settlements in Normandy.